When I first moved to Paris, I scoffed at the notion of even being within sniffing distance of American food. Bah! Truth be told, it took a long while before I even deigned to go out for sushi or Italian food. I was in PARIS, for cripe's sake. I was there for the cuisine. I couldn't believe the tales of Americans flocking to McDo's for a Big Mac fix, or heading to The Real McCoy on rue de Grenelle in Paris to buy a bottle of maple syrup. But then, after a year or so, life kind of... normalized. I disovered the occasional joys of hamburgers in Paradise: Paris. The best I've ever had. Recently I discovered a site which is a boon to residents of France who, in between feasting on foie gras or poulet fermier, simply have to have their PB&J or Tex-Mex chili or pumpkin pie: My American Market, an online grocery store for American food in France. So important this time of year, too, when you just gotta have that candy corn or cranberry sauce! When I first heard about it, I assumed it was a start-up by some enterprising American expats in France. Mais non! It was launched a few months ago by Anne-Claire Bocage, a French woman who had spent a few years in the U.S. Upon returning to France, she had a few cravings of her own, and --voila! -- a business was born. Intrigued, I contacted Anne-Claire to ask a few questions. 1. How did you come up with the idea? Was it just inspiration? Frustration? My American Market’s adventure all started because of a ranch dressing craving (big things can happen because of cravings, so don’t rebuff them!). Back living in France after several years in the States, I was dealing with a lot of cravings. 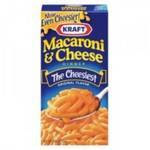 Besides, I wanted to share with my entourage some American recipes with the right ingredients. I tried different options to get my favorite American treats and none were completely satisfying to me. Therefore I came up with this idea of a service that could satisfy most common US food cravings at anytime of the day or night. 2. Where do you get your ideas for products to offer? 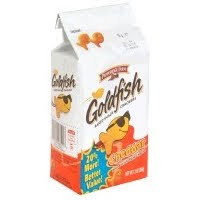 Do you have a suggestion box for Americans who are craving certain products? I did an extensive market study before launching; I looked at what other European stores were offering. I also polled potential customers through an online survey. I am very grateful over 300 people took the time to respond. Now that the website is up and running, I am getting a better feel of what is popular. I also get a lot of product suggestions that I take into account for expanding my selection. 3. What are your most popular items? 4. Do you have many French customers, or are they mostly American? Other nationalities? Well, I don’t check IDs when customers are placing an order! But I am getting a sense that I am mostly serving Americans, or French people who have lived in the States for several years. Sometimes when promoting my service, it has been a challenge to deal with negative stereotypes French people carry about American food and cuisine. But I consider this is one of my missions as an “épicerie américaine!” Read more about it on my blog. 5. What is the reaction of French people when you tell them about your business? I often hear "Why on earth would you want to sell unhealthy American food when you live in a country with such sophisticated and savory cuisine?" - I like the taste of it! Nothing can beat beef jerky as a snack to me. I know some of you would travel very far for a peanut butter cup. 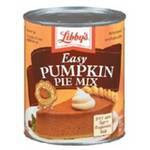 There are no substitutes here in grocery stores for cooking a decent pumpkin pie or spicing up your homemade chili. - I love spreading American tastes. It makes me feel like I am contributing to fighting stereotypes or short-mindedness. 6. Are there any other services like yours in France? Yes. 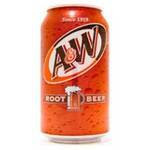 There are a couple of stores in Paris that carry an equivalent selection of American food products. Yet, My American Market’s way of doing business is dramatically different. First, it’s an online store. Not everyone in France lives in Paris! And even in Paris, it can be a hassle to get stuck in traffic, fight for a parking spot, carry heavy grocery bags around. It was important to me to offer a fast and convenient service for anyone to shop whenever the cravings get them and to have the products be delivered right to their door, wherever that front door might be located! Second, I am building a business that is more than just a regular “Epicerie Américaine.” It is a place with a sense of community, the American way! I use Web 2.0 tools and create a platform with many possibilities to communicate, exchange, network, cooperate, play and have fun with other members of the American community and friends. I’d like everyone to take part in the process if they wish, so My American Market becomes everyone’s contribution. If anyone would like to get a better feel of what I am doing, please become fan of My American Market on Facebook. 7. Do you have an estimate of how many American expat households there are in France? [I know there are official numbers, and some unofficial numbers.] Or semi-American, i.e. an American/French couple. It is very hard to know how many Americans are currently living in France. I estimate there are 100,000+ citizens: 50% in Paris and its suburb, 50% in the rest of France. 8. Any good customer quotes? 9. Of course, this time of year is big for Americans and their food cravings. Halloween, Thanksgiving, Christmas. Do you stock special seasonal items for the American holidays? I'm thinking candy corn, cranberry sauce, canned pumpkin pie, mint jelly, candy canes, etc. Of course, we do carry seasonal products and the Holiday season should be our busiest time of the year. Our Thanksgiving and Christmas products can be found in the seasonal products category. Labels: cuisine, shopping, where am I? In a parka do bun do? "In a parka do bun do, in a parka do bun doooo...."
Well, at least that's how I first understood the lyrics to "Dominique," the wildly popular song in the early 1960s. You remember, Dominique-nique-nique? Sung by the Singing Nun, aka Soeur Sourire, it was already a hit when she made her debut on the Ed Sullivan show. My family owned the LP back in those school-girl days before I knew any French. So I used to spend hours curled up on the sofa listening to "Dominique" over and over, trying to decipher "onto shemay altude you, in a parka do bun do." Then I found the lyrics printed on the album cover. I must have worn a groove in the vinyl as I repeated the torture until not only could I match each written word to the sung French but -- at long last -- was actually able to repeat it. It's still incredible to me to think that a French song about a saint could have topped the charts on American pop radio. Soeur Sourire eventually disappeared from view, and I despised the saccharin Debbie Reynolds film version of her. I'd forgotten about her over the years. Then on last Sunday's episode of Mad Men, what comes filtering out of Miss Farrell's apartment when she opens the door? Yup. Domnique -nique -nique. And now in a parka do bun do is stuck in my brain. Opinel Knives in the U.S.
Opinel. For those who know it, the very name conjures up impromptu picnics in the French countryside. Relaxed on a blanket in the shade, using your folding Opinel knife to cut a slender wedge of brie or saucisson, slicing a piece of crisp apple or juicy pear. To me, anyway, an Opinel knife equals quintessential, classic France. Simple and perfect. 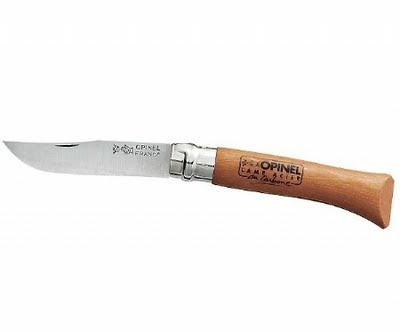 An Opinel was always a perfect inexpensive gift to bring home from France (tucked securely in checked luggage!) because, after all, Opinel knives aren't available in the U.S. Right? Wrong! Opinel knives are now sold online through Opiknife.com. Every kind of Opinel imaginable, it seems, from the blunter Opinel Jr. to more serious stainless steel folding knives to last a lifetime. I spoke with Frederic, the owner/distributor of Opinel USA. "I had my first knife when I was about ten," he said. "It seems most Americans don't give their kids knives to learn how to use them any more." We agreed that this was a shame: the joys of whittling and proper knife usage seem to be largely ignored. On the other hand, maybe I just haven't met the right American kids. Maybe they do still teach proper knife usage in the Boy Scouts? But here's the extra-cool part, and the reason that I discovered Opinel in America in the first place. Opinel France has made limited edition Lafayette-Hermione folding knives from the excess wood of the reconstruction of Lafayette's boat l'Hermione. And the handle is stamped with the name. Opinel is donating a percentage of the proceeds to helping l'Hermione make her voyage to the east coast of the U.S. in 2012. Today is Global Blog Action Day. When I was first asked to participate, I knew immediately what I wanted to write about. If you have an hour and a half to spare for the planet, I highly recommend French photographer and environmentalist Yann Arthus-Bertrand's exquisite 90-minute documentary Home, produced by Luc Besson. The photography is breathtaking and the message is compelling. Earth is our fragile island home -- the only home we have. Our challenges in taking care of our home today and in the future are complex. Arthus-Bertrand, perhaps best known for his documentary and book Earth from Above (La Terre vue du ciel) has given up author's rights to Home so that all may see it on the web. You'll be glad you did. For more information check out his website GoodPlanet. Paris, as a capital city, is host to hundreds of embassies, many in sumptuous palaces. But the grand architecture we now associate with the missions of the foreign countries wasn't always the case. During the Ancien Regime, most foreign emissaries to Paris were housed wherever appropriate lodging could be found -- and often according to the value of their good graces to the Court and a complex hierarchy of precedence. But in the 19th century, with increased international relations, came the necessity of finding permanent dwellings for these foreign ministries. The opportunity for housing befitting a nation presented itself in the wake of the French Revolution. Many grand mansions of the aristocracy, now vacant, were acquired for the diplomatic missions. We thus too seldom have a chance to view their lush, gilt interiors, their art treasures and ornate carved panelling. These chancelleries and embassies remain as mysterious to us as the intricate codes of diplomacy. Now we have the good fortune -- at least in book form -- to peek inside for the first time. In Ambassades à Paris, author and historian Elisabeth Martin de Clausonne and photographer Hermine Cleret take us inside for a tour of these magnificent buildings. Text is in French, but the photos speak for themselves. I'm such a sucker when it comes to authority. Especially when the authority is French and I'm not sure if I've done something wrong. I wilt with guilt, while hastily trying to figure out how to excuse/charm my way out of it. But today, in my email inbox was a new challenge. A notice from impots.gouv.fr informing me that I was eligible for a tax rebate. Après les derniers calculs annuels de l'exercice de votre activité, nous avons déterminé que vous êtes admissible à recevoir un remboursement d'impôt de € 178,80. I ran through my mental rolodex of taxes duly paid. Taxe d'habitation? Check. Redevance audiovisuelle? Check. Taxe... well, check, check, and check. But something didn't ring right -- ca ne clochait pas. I had never given the Fisc my blog email address. So I google-checked it, and sure enough, on the Fisc website there is a current warning of a phishing scam. Fabric is so cool. Have I mentioned my love affair with fabric? Oh, yes I have. So I was naturally ,er, ego-pleased to see this sweet Paris-icon fabric called "Polly Goes to Paris." Zee poodles! Zee Eiffel Tower! Zee bicyclettes! Zee cafes!